This picture melts my heart. This was the first morning we were home from the hospital, complete as a family of four. I was on the couch with the baby, up very early of course. 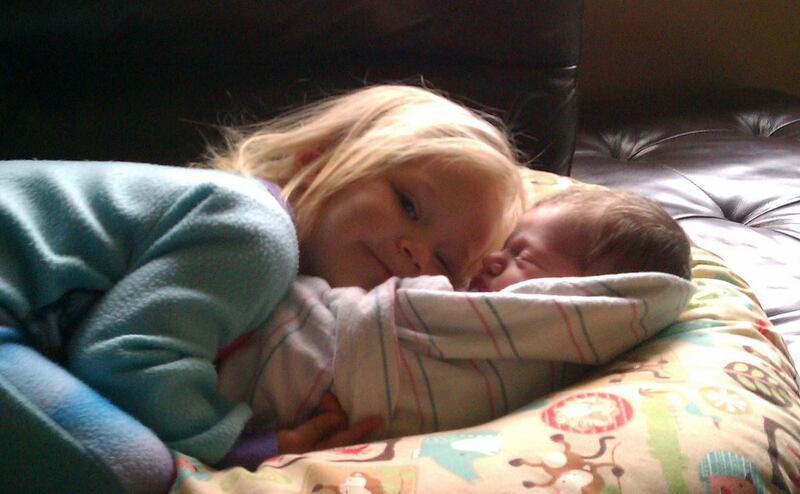 When my daughter woke up and came out of her room, the first thing she did was go over and give her brand new brother a hug. It was a beautiful moment and I am forever grateful that I not only got to witness it, but that I was able to capture it on film. I can relive that beautiful, loving, joyful, sweet moment over and over again. And trust me, I do. When I’m having a tough day, or the kids are out of control, or are fighting over a toy, or one of the many other stressful situations that pop up daily, I always come back to that photo. It calms me and reminds me of the unconditional love we have for each other. No matter what happens, we will always have each other. My husband and I always knew we wanted two children, and we knew we wanted them relatively close in age. I wanted my daughter to have a sibling, a friend, a partner in crime. I count my blessings every single day that we were able to conceive and give birth to two beautiful, healthy babies. I am also thankful that both my husband and I were in agreement that we wouldn’t have any more than two. I don’t know how people do it. Not only are children expensive, but to be outnumbered by your kids…crazy!! Some days I can barely handle my two, never mind more. To all of you with more than two children, you are super stars. Our choice to have a tubal litigation was a no brainer for us. Throughout the pregnancy and each day since, we have had zero doubts about our decision. Since I am Type 1 Diabetic, my pregnancies were high risk. I also had trouble with high blood pressure after both births. And, my OB informed me that I had a very thin uterus. All things that led us to believe our decision was the right one for us. Not to mention, the overwhelming feeling of completeness we had after our son was born. However, others have not been so sure. Most people are very surprised to find out we have no intentions of having any more children and that we aren’t able to, due to my tubal litigation. Maybe it’s because my husband and I both look young, I’m not sure. We have been judged by many about our decision. But, it was OUR decision, and we feel it was the right one for us. I couldn’t imagine our life any other way. Just the four of us. Perfect. The kids are truly the best of friends. Lauren loves to teach her younger brother all sorts of things and Justin is more than happy to learn from her, copying her every move. They make me smile and laugh every single day. And during the not-so-great moments, I just take a peek at that picture. Love. Enjoy the Festivities in Plymouth on the Weekend Before Thanksgiving! Good for you guys…we are currently deciding on the procedure, we also have 2 kids and think that is enough. Our daughter is 12 and little guy is 4months where she is quite the ‘mother hen’ and think our unit is great at just that. Such a beautiful blog Rachel. You have a beautiful family and you are great parents! Keep up the good work, Love you! !